In cold winter: When you going to drive the car, can distance remote start engine first, for preheat the engine, then can drive the car just step on the foot brake. Saving the time. In hot summer: The inner of the car will be very hot because of under the scorching sun, then you can remote entry ACC & open the air-condition to change the fresh air. Make you enjoy the cool air when driving. Simply distance remote lock/unlock the door, more convenient. Also can keyless lock/unlock the door. When you close the door and walk away from the car, just simply press the button of car handle to lock the door and enter arming. Also will lock automatically if the driver forgot to lock the door, more safe. When you approach your car with smart key, the system will identify the valid remoter automatically. Simply press the button of door handle to open the door, saving energy. In the unlock situation, distance hold on the trunk button to remote open the trunk, more convenient. Take along the remoter, make the auto shift on "P"/"N", step on the brake pedal, push the start button to start the engine. The ignite switch install on the dashboard for easy to touch. Convenient to start the engine by simply push the start button. Completely abolish the metal key. The system will verify if there is legal smart key in the car before allowed to start. It can guarantee the safety. 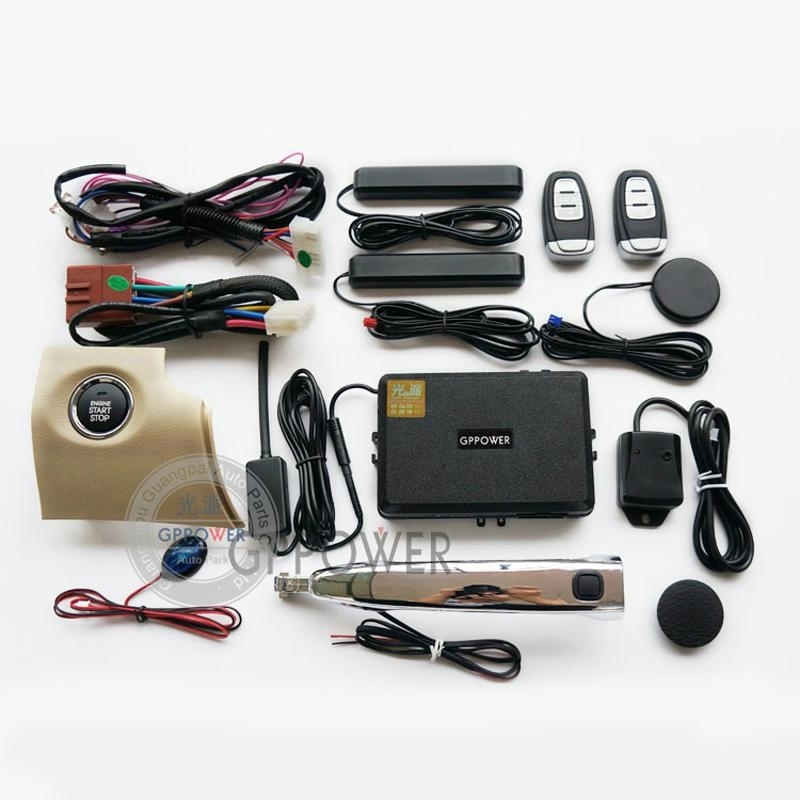 The alarm system will comprehensive protection car. Once user go into the car and attempt to start engine, the car remote start system will verify the driver's smart key. If a valid smart key is identified, the LED light will turn off and allow to start the car. If not, the horn sound and light flash to entry alarm, the vehicle engine can not be started. Just simply put the remoter close to the IMMO sensor, then can release arming in emergency, such as the remoter have no power, or signal interference. Install with special dashboard and inductive handle. More fashion, just simply press the inductive button on the handle to lock/unlock the door, saving energy. Also will lock the door automatically after the driver parking and away from the car with smart key, more safe. When parking on curb and get off temporary, sometimes will have an accident when open the door, but after install this system, the light will flash for warning the rear car and person when open the door. Avoid the accident. When the car entry arming, if any door did not close well, the system will sound and flash the light to remind the driver. After release arming, but did not open the door and into the car within 25 seconds, the system will back to arming situation automatically, in case some driver press the remoter to unlock the car by mistake, avoid the thief go into the car because this mistake. After start the engine 15 seconds, step on the foot brake, central lock will lock automatically, will unlock after flameout. Protect the estate of passenger and convenient for get off. When meet rob, hold on "lock" button of the smart key in the effective distance, the system will entry anti-rob function, the car will sound and flash the light long time, to make the passenger note and drive the scoundrel. 13. Main host with extend antenna, more strong single. Push button stop engine, close the door well, take along the remoter and away from the car, entry arming, four windows will rise up one by one. When driver approach the car, short press the unlock button of the smart key twice, the front window will down for change the flash air.